The Institut für Textiltechnik (ITA) is one of the largest institutes of RWTH Aachen University and one of the leading textile research institutes in Germany. Currently almost 100 researchers, including postdoctoral and doctoral candidates, do research in the field of textile machinery, new materials and recycling as well as in the field of fully renewable biobased composites. With two European partners, ITA developed a racecar seat consisting completely of flax and polylactic acid (PLA). In the field of biocomposites, ITA focuses on developing composites that are made completely of natural materials. There are several possible routes to produce fully biobased composites. Nature Wins is a recently successfully concluded project on which ITA and two other European project partners developed fully renewable thermoplastic biocomposites. The project focused on the development of biocomposites based on long/continuous industrial natural fibers as reinforcement and thermoplastic biopolymer fibers as matrix material. The scope was narrowed further by focusing on a production route based on blending both matrix and reinforcement in fiber form and using compression molding as the composite formation process. The project goal was to produce a racecar seat consisting of a nonwoven made using a blend of flax and PLA fibers (polyactides). ITA selected the natural fibers and developed the textile processes as well as semi-finished parts, concluding with an ecological valuation and testing of the seat. In summary, this project shows that flax and PLA show excellent compatibility and adhesion, making these materials a very good combination for composites. Consolidation and impregnation of flax/PLA composites can therefore be achieved within an acceptable process window. 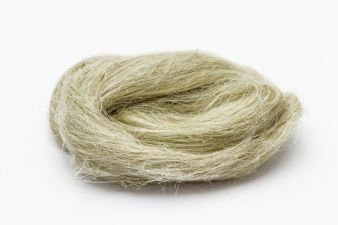 The environmental assessment showed that flax and PLA have strong potential to reduce global warming effects, but that some attention is still needed to address other environmental effects, mostly related to agricultural practices. Grateful acknowledgement goes to the research association Forschungskuratorium Textil e. V., a branch of the German Federation of Industrial Research Associations (AiF), for the financial funding &#151; through AiF-CORNET &#151; of the research project AiF-No. 48 EN. The writers would also like to thank project partners Centexbel, Belgium, and Sirris Leuven-Gent Composites Application Lab, Belgium. Innovative solutions in the field of textile machinery and technical textiles from basic research to application-related research are offered at ITA. Editor&#146;s note: Dipl.-Ing. Marie-Isabel Popzyk is a research fellow, and Univ.-Prof. Prof. h. c. Dr.-Ing. Dipl.-Wirt. Ing Thomas Gries is head of research, at Institut für Textiltechnik (ITA) of RWTH Aachen University. Dr.-Ing. Yves-Simon Gloy is division head, Textile Machinery/Production Technologies at ITA; and adjunct professor, Department of Material Science and Engineering, College of Engineering and Science, Clemson University.